If you don’t already know, rosewater is used a lot in the kitchen but also in different beauty routines. The benefits of rosewater are many and plenty, and it literally has hundreds of different uses! Today, we’ll show you how to make your own rosewater and then how to use it as part of your beauty routine. Obviously, rosewater is just as its name suggests: roses + water. This mixture gives your skin a really good boost of hydration and it also has inflammatory properties. But really the best part is that it smells HEAVENLY…you know…like roses! And did I mention that it’s $10 for a very small bottle if you buy it at the store? No thanks, I think I’ll make my own for a quarter of the price! Simply pour your rosewater mixture into a small spray bottle and spray over entire face OR use a cotton pad to apply to your face. The toner can be used every morning and night. Plus your face will smell like a rose all day long! Pour about 1 cup of rosewater into a running bath. The scent will totally relax you and you’ll get a good dose of hydration. 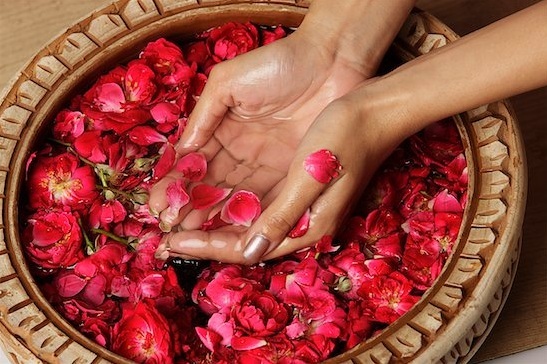 Pour some rosewater into a spritz bottle and apply to your wrists, necks, etc…for a heavenly rose scent. No alcohols, no other chemicals, just pure, blissful rose scent. Set it and forget it! Rosewater is one of the best makeup setters, but when you make your own, not only are you saving money, but you’re also omitting all those are ingredients that are totally not necessary.